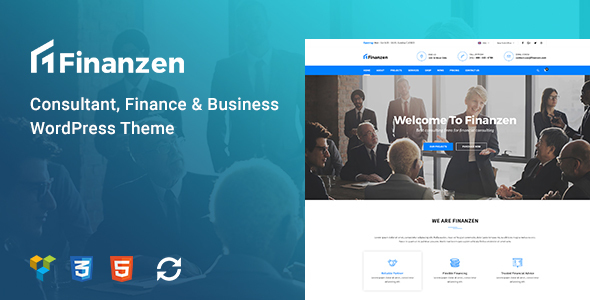 Latest Version 1.0.3– May 30, 2018 – view changelog WordPress 4.9.x Ready WooCommerce 3.4.x Ready Visual Composer 5.4.x Ready Finanzen is an incredible consultant, finance and business WordPress theme, perfectly designed for Financial companies, Financial firms, Investment, Insurance, Accountant, Tax-related or any kind of business. The brilliant theme covers you all necessary elements and pages what a professional financial site need as project pages, shop pages, blog pages, about us pages and so on. Plus, the theme is powered by Visual Composer (save $34) and Slider Revolution (save $25) allowing users to set up the business site easily, conveniently and efficiently. Now please check Finanzen’s full features below! Compatible with WooCommerce 3.3.x, WooCommerce 3.2.x, WooCommerce 3.1.x, WooCommerce 3.0.x, Visual Composer 5.1.x, Visual Composer 4.12.x, Bootstrap 3.x. Finanzen has been tested with browsers IE11, Firefox, Safari, Opera, Chrome, Edge.